How do we discuss the news? Journalism gives a community something to talk about. The next day at the water cooler with your co-workers, at the dinner table with your family or at the bar with your friends, what’s on the news sets the topic of conversation. One could argue that this is one reason why journalism and the media are so important. They set the agenda for local and national conversations. It gives us space and a reason to face ourselves, confront topics and converse with our neighbors. With the help of the Whitman Institute sponsorship Spot.Us is exploring how we talk about the news with our colleagues, what we discuss and why. The results of our last 200 person survey are below with some analysis. See the first Whitman Institute survey here. Our next Whitman Institute survey just went up. You can go to Spot.Us and click “free credits” on any pitch. Taking the survey not only informs what we know about how you think/use the media – but funds an the independent reporting project of your choice! As always it’s important to note that Spot.Us is not a polling company, but these do represent real answers from unique individuals. Our first question was just to see if indeed people do discuss the news with family, co-workers or friends. Only 1 percent of respondents didn’t discuss the news at all. 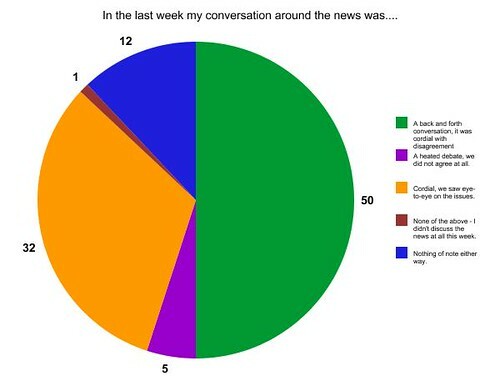 The majority (57 percent) of responders say they discussed the news on a daily basis with another 25 percent saying they discussed the news “a few times” in the past week. The next question we wanted to ask was about the nature of the conversation. So much of our political discourse is polarized. We wanted to get a sense of whether or not that was the case in our every day lives too. Do conversations around the news get too heated? Or are we simply talking with folks we already agree with avoiding any debate or confrontation? There are many ways to interpret these results. That half of our conversations are cordial with disagreements does show a strong contrast with what we are presented on television, where almost every conversation turns into a shouting match. And yet roughly a third of our conversations are with people that we already agree with. While I think we could use less polarized bickering on cable television, perhaps we could use some more heated (but healthy) debate in our everyday conversations? All bar graph results mean that individuals could choose multiple answers. This means the total possible number of ‘votes’ was out of 200 instead of a percentage in a pie chart of 100. 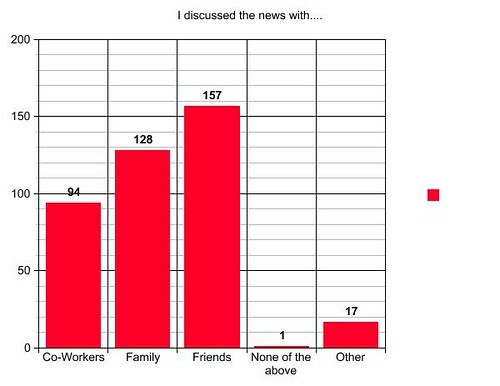 When we asked individuals who they discussed the news with, it turns out that the winner was “friends.” Nearly 80 percent of all respondents or 157 individuals discussed the news with their friends in the past week. Family was a close second and only 94 individuals (nearly 50 percent) discussed the news with co-workers. Something the graph below doesn’t show was where answers overlapped. 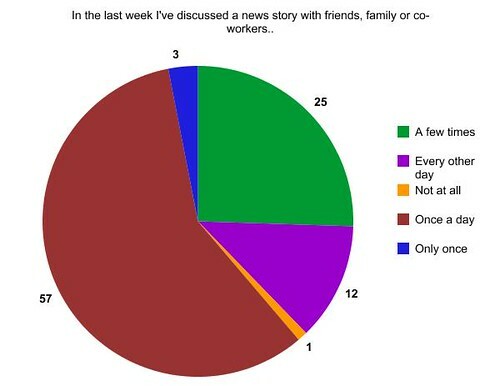 Almost all individuals that discussed the news with co-workers also discussed it with friends. 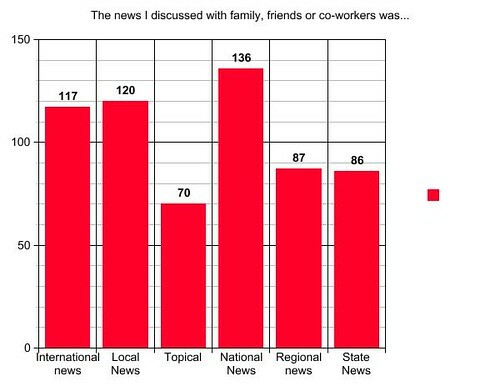 If you discussed the news with family you were more likely to also discuss it with your friends than co-workers. It was these two predispositions that allowed “friends” to come out as the most popular answer. Only 25 percent of respondents felt comfortable discussing the news with all three types equally. Funny enough the most popular “other” example that was given was – strangers; either in person (on a bus) or online. The survey results here were surprising because it goes against everything we hear about news preferences online. Instead of niche news (topical, including sports) being the most popular, it was the least. Perhaps because Spot.Us is a self-selecting community the most popular news to discuss was national and local news with international news following right behind. This could also be because during the survey the debt ceiling news was reaching a fever pitch and international markets are in turmoil. The immediate positive aspect of this pitch is obvious. 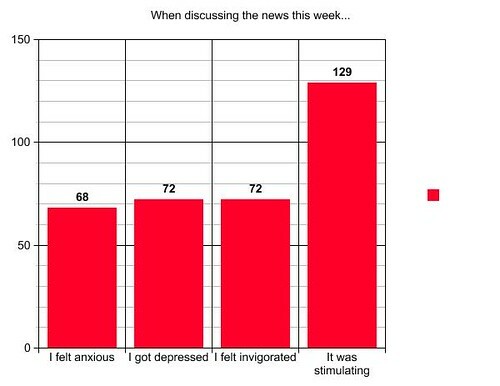 When discussing the news we feel stimulated. But because these answers are not mutually exclusive we also feel anxious, depressed and invigorated almost equally. A total of 41 individuals or 20 percent of respondents said they only felt either depressed or anxious. Meanwhile 90 individuals or 45 percent felt either only invigorated or stimulated (51 individuals ONLY felt stimulated). The news we discussed was overwhelmingly abstracted from our deeply personal lives. The vast majority of the news we discussed impacts us in a broad sense ie: the national debt ceiling. But some of the open ended answers about what news we were reading shed light on this further. 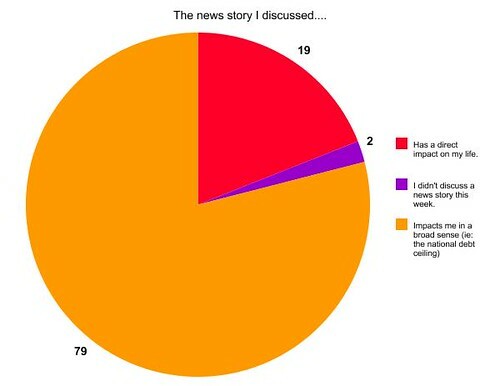 The 20 percent who discussed the news that did have a direct impact on their life felt a deep connection to the stories whether it was Carmageddon in Los Angeles or a local shooting. These are the full answers about news stories discussed by Spot.Us community members, but their names have been withheld. What DON’T I discuss? I’m obsessed with the Murdoch takedown. OBSESSED. I have discussed the debt crisis, local crime, the governor of my state and what he’s up to…I’m a big chatty newsy person. I love to talk about all the news all the time. Carmageddon, obviously. Even my parents back in Boston had heard about it. I was actually kind of amazed it was national news, so we talked about that. Rupert Murdoch’s impact on politics in the UK and the US. The US national debt. Republicans. Political wrangling going on in Washinggton. One story was about Seattle City Council passing an ordinance allowing food trucks on streets and not just private lots. Another was about the Women’s World Cup final game. Another was about the Seattle Sounders match. Too many to mention. one that still stands out is a radio show on the situation of human trafficking, and the apathy of many that goes along. also the bay area seems to be an international hub of sorts for such illegal activities. who knows about such? Police shooting of 19-year-old boy by SF Muni police. I discuss news stories at least twice a day. Usually more often. This particular news story is regarding the fires in the Southwest, specifically New Mexico. Our drought. And the causes of the fires and drought = climate change. Discussing news is helpful….it informs life and makes us better, engaged people.